Every player has their own biases and preferences when it comes to deck selection. There’s nothing wrong with playing to strengths, and it is important to remember that Magic is a game. You have more fun playing something you enjoy. 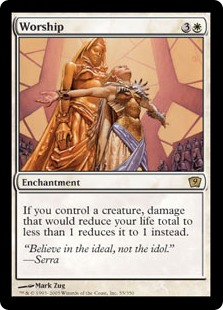 However, this goes both ways, and you can dislike a deck for less-than-rational reasons. I have a problem with the most popular version of Bant Spirits that has little to do with the deck itself. I don’t enjoy playing the latest version of Bant Spirits, but that doesn’t mean that it’s a bad deck by any means. I prefer UW Spirits, and would probably play it even if I didn’t have hang-ups with the Bant version. Outside of personal preference, I don’t feel that Bant Spirits in any form utilizes Collected Company very well. Why this is and how I’d rather use Company are the topics for today’s article. While I’ve been experimenting with new decks since the end of PPTQ season, I do make sure that my workhorse is in shape. UW Spirits will remain a powerful tool against the Modern metagame while control decks, Burn, and Humans dominate Tier 1. I haven’t had much reason to change the maindeck, but I have been working on the sideboard. My anti-creature plan of winning the tempo game and using Slaughter the Strong to catch up left something to be desired. Here, I instead went for a prison plan using Worship. Cutting the Slaughters for another Echoing Truth has paid dividends against UW Control. Terminus is hard to fight, but responding with Truth to retrieve whichever creature we have multiples of saves the day. Truth is also great against tokens and any deck with problematic permanents like Ensnaring Bridge. Worship has been a bit of a disappointment for me. Players have gotten the memo about Spirits and know to bring in answers for non-creature permanents. Assassin’s Trophy also really hurts the card. I’ve had success using it as a multi-turn Fog to buy time to catch up on damage, but it never earns an automatic concession anymore. I’ll keep looking for a better anti-creature strategy. Other than that, I’m very happy with UW Spirits. However, despite some strong showings, UW is still not the Spirits deck of choice for most Modern players. That honor goes to Bant Spirits, and specifically the version with Aether Vial. Ondrej Strasky won GP Stockholm with the deck, which has since received the endorsement of a Hall of Famer. While the no-Vial version isn’t my cup of tea, I like that version better than this one. I feel that the deck is full of compromises. Both Ondrej and Paulo admitted as much. It is a hybrid between UW and Bant, picking aspects of one to cover weaknesses of the other. As a result, it has better matchups across the board, but its good matchups aren’t as favorable as those of the other Spirits decks. With fewer Company hits, Vial Bant isn’t as grindy as no-Vial Bant, and fewer Vials and Rattlechains means it isn’t as tricky as UW. It therefore leans more on hitting lords than either alternative does. Merfolk players know well the power of lords, but leaning on a small number of cards to make a deck good creates more failure states through variance or disruption. I’d rather have spikier matchup percentages and more reliable gameplans. Another aspect I don’t like is the lack of Rattlechains. Paulo likes the card, but needed something to cut, while Ondrej just thinks it’s bad. And true, Rattlechains isn’t very impressive in terms of stats; rather, it shines given the context, and I’d argue that this metagame is friendly to Chains. Against Jeskai, it’s Spirits’s best card, since that matchup revolves around two-for-ones. Even when that isn’t the case, Rattlechains is powerful because it’s a flash creature that makes more flash creatures, allowing the deck to play at instant speed. Rattlechains is a card that to jam on the opponent’s end step after making them play around a counterspell, hopefully sub-optimally. After that, it creates more uncertainty for the opponent, as we could have anything at anytime and potentially wreck them. This intangible information advantage and stress generation can translate into game wins. Vial Bant Spirits is a Frankenstein of a deck (for the record, any commenter who says “Actually, it’s Frankenstein’s Monster” earns my scorn). Bant and UW have separate identities as the deck that overwhelms or outplays opponents, respectively. This new version is a hybrid, aspiring to the overwhelming card advantage of Collected Company and the tricky mana advantage of Aether Vial. Maybe if I hadn’t worked on Spirits as long I as I have, I wouldn’t have a problem with the Bant Vial build. However, my experience with the archetype renders me acutely attuned to the minor inefficiencies that hybridizing Bant and UW creates, and subsequently to where each deck is superior to Bant Vial. Bant Vial has fewer creatures than no-Vial, and so Company whiffs more often. It also can’t run all the utility lands, and they’re integral to no-Vial. Despite only having three Vials, Bant Vial is more reliant on them than UW. Rattlechains provides UW a lot of flexibility and makes it easy to play at instant speed and gain more value from Captain or Phantom. To match that, Bant Vial must either hit well with Company or have Vial out. UW also has more flex slots maindeck which allows for more metagame tuning and adaptation. In other words, because of my experience I can see the seams and scars left over from making the monster. Other players seem to see what the creator intended; a new lifeform, whole and flawless. It cannot be that to me, at least right now, because I’m too invested in the results of my own tweaking to stomach the stitch-work. One big issue with the hybridized Spirits deck is its lackluster Collected Companies. The deck has few passable targets outside of Drogskol Captain. Casting Company to look for Spell Queller or Selfless Spirit in response to a dangerous spell has a high ceiling, but can be quite risky. Company is not a card that can just be jammed into any deck with creatures and be great. Yes, Company will find creatures and put them into play, which is always card advantage. Company can be straight tempo advantage if it finds 4+ mana worth of creatures, but simply getting creatures from the deck on the opponent’s end step technically provides a tempo advantage, too. Digging six cards into the deck is also quite good. However, that’s not what makes Company a great Magic card. Playing Company “for value” is like using Black Lotus to cast three Birds of Paradise turn one. It’s not wrong, but it is a long way from right. If believe the best way to play Collected Company is to play Collected Company. Or, because I like using symmetrical tautologies as a teaching tool, instead of going for value, play Company for value. Company decks excel when they use the card to explicitly go for the most value as they possibly can. The Standard Bant Company decks that nearly got Company banned were built to maximize each Company. They were designed to hit 5-6 mana worth of cards every time, and every single creature gained value on its own. The creatures were already spells, and Company made them instants. Modern has typically used Company to dig for combo pieces, which is also very good. So why mess about with dinky fliers? Most recent Bant Company decks revolve around Knight of the Reliquary. Sometimes it’s to execute the Retreat to Coralhelm combo, but usually they’re just big threats that find utility lands. I don’t like this plan. Coralhelm combo has never worked as well as Splinter Twin, despite hopes to the contrary, while Knight takes too long to become threatening in my book. Durdling around fetching lands and getting wrecked by Fatal Push is not what I want from a Company deck. Instead, I want my Bant Company cards to be good right away. I’ve included the Devoted Druid combo package because winning on turn three is very attractive. I’ve only included a few copies of each piece because my experience has been that it just isn’t a reliable path to victory when the opponent has any interaction. Considering the aforementioned metagame, I expect plenty of interaction. However, it’s nice to just win against linear decks. I wish I could risk cutting the Path to Exiles for additional copies of Knight of Autumn, Spell Queller, and Reflector Mage, but dedicated Counters Company Combo is popular enough in my area that I need cheap answers. The goal of the rest of the deck is to get as much value from our creatures as possible. Hitting any two utility creatures on is great and frequently provides more than two cards and six mana of value. In testing Reflector Mage plus Knight of Autumn has been game winning against Hardened Affinity while Voice of Resurgence and Scavenging Ooze are huge problems for creature decks. Queller is frequently mediocre off end step value Companies, so I’ve starting firing Company off in response to almost anything Queller can stop just to get that sweet value hit. This greatest advantage is deck grinds harder than a machine shop. Chaining the same Company using Eternal Witnesses is backbreaking for any attrition deck, and Witness is arguably the best hit as a result. So too are an active Tireless Tracker or Duskwatch Recruiter. So long as sweepers are kept in mind, it is almost impossible to run out of gas in this deck. Couple that with Gavony Township and, given time, there’s no fair deck that can’t be out-valued and overwhelmed. Tron is a weakness game 1, but that’s why my current sideboard is Damping Sphere. And nothing else, as I’m still working on the sideboard and am spoiled for choice. There are a lot of options to transform the deck into a straight combo deck, change up the value package, or go for traditional hate and hole-filling, and I don’t know which is best. I don’t even know if this Bant Company deck is better than Bant Spirits. What I do know is that I’ve never felt like I’m wasting time with Company in this deck, and that nagging disquiet I get playing Bant Spirits is gone. Certain decks just don’t fit some players style or preferences. Regardless of its results, Bant Spirits just isn’t for me. I want my Spirits to be tricky and Companies so value-laden they melt the table. That doesn’t mean the alternatives are bad in a vacuum. The format is Modern. Pick what you want to play and master it. 100% agree with your take on Bant Spirits with Vial vs. UW, also agree with not liking Worship. Question: Why not run more Echoing Truth in the side, and play hard towards the tempo plan after board? As you point out, Truth has very wide versatility on both sides of the battlefield. It deals with recurring graveyard permanents like Vengevine or Amalgam well. It hits Ensnaring Bridge, and planeswalkers, and shrinks large creatures from Humans and Hardened Scales decks that have loads of counters on them. I’m thinking its time has come, and Id appreciate your thoughts on this. Right now I’m even considering a playset. I’ve certainly thought about it, though I’m not sure a full set sideboard is correct. If you want to go that far I’d find maindeck room for pair.